First things first, did everyone catch all those TVD references in last night’s episode? Oh, it was so good! Let’s give The Originals a round of applause. They finally remembered who their core audience is and gave us some sweet references to characters and episodes we had once obsessed over, before. Loved that shout-out to Stefan Salvatore. *Wink* There was so much going on in this episode, so many twists and turns. We need to make this intro quick. There’s a lot to talk about. Shall we get to it? “Rise and shine, night walking nation!” Klaus is on the war path, so you better get out of his way. After finding the coin with the Nazi emblem on it, Klaus heads to the vampires’ hide out. He needs to know who took Hayley. NOW. No one is talking, which is making Klaus a bit hangry. He bites one vamp after another, until finally the culprit speaks. Why it’s. . . I’m sorry. What’s your name again? Oh, yeah. That’s right. Greta. I remember you. You’re the one that’s been super cranky lately, voicing your opinions when no one wants to hear them, saying bad things about Marcel and Klaus. I knew I didn’t like you. Without much fuss, but with some blood loss, Greta admits to kidnapping Hayley and knowing an old friend of Klaus’. Cue the flashback! August is a painter, but not a very good one. Klaus is right to criticize. He’s been around for centuries, after all. He knows good art when he sees it. August takes offense to this, but someone comes to his rescue. I believe you’ve met him before. Hello, Elijah. After being separated for thirteen years, Elijah has come to warn Klaus about big bad papa Mikael coming and trying to ruin all their fun. Packs of werewolf’s are being murdered, one right after the other. All signs point to Mikael, but Klaus disagrees. He’s being discreet, there’s no way Mikael would find him here. Elijah is also concerned that somehow Mikael found Rebekah and forced her to tell him Klaus’ location. Klaus still disagrees, stating that Rebekah is happy and healthy and living in Chicago with some bloke named Stefan. I know him! I know him! Suddenly, Klaus has a spark of inspiration. Splattered on all of the newspaper articles about those recent werewolf murders is a symbol, a symbol that appears in every one of August’s paintings. Light bulb. He did it! In New Orleans, Greta makes her very strong opinions known. She and others like her believe that Hope is a menace. Being part werewolf is disgusting, being able to make hybrids at will is a threat to all vampire kind, only pure blood vampires should be able to live. . Blah, blah, blah. Klaus and I don’t like that kind of talk around here. Greta demands that Hope have her werewolf side bound and caged. It’s a spell that Klaus knows quite well. He was once bound by it too. Callback! If Hope doesn’t suppress her inner werewolf, Hayley dies. Back in Mystic Falls, Freya is teaching Hope all the cool tricks that come with being a hybrid. First, as a vampire, you can do parkour without wasting a breath. Secondly, as a werewolf, you can be strong and powerful, but you also have to murder someone and have every bone in your body broken. Hope isn’t really keen on that last part, but tells a meddling Freya that she should have the right to choose. Sometime later, Roman breaks into Hope’s room. He’s such a stalker. Hope questions why the vampire is so enthralled with her, but only gets a simplistic answer. Hope is a hybrid and the daughter of an Original, that makes her interesting. She laughs it off, but requests Roman tell her something about himself. An eye for an eye. He tells her that once upon a time he pissed some people off and found himself desiccated in a cave. It’s a tale we’ve all heard before, yet Hope seems impressed by his sob story. Still awaiting an answer in Klaus’ caverns, Greta eyes a sympathetic Josh. Despite her anti-werewolf rhetoric, he helps her keep her strength up. He admits to showing her kindness in order to convince her to let Hayley go. When Marcel catches him, Josh suggests that he, maybe, understands where Greta is coming from. He might share her ideals. Bad Josh. Bad. Marcel is shocked and warns Josh to stop this line of thinking immediately. It’s only going to get him into trouble. Greta’s hatred is going to get her into trouble, too. With a few hints from Greta, Klaus suspects that he is hosting a few traitors under his roof. Paranoid, Klaus requests allegiance from Marcel, but Marcel is hesitant to give it. He wants to be a partner. He doesn’t want to be secondhand to the King. This is why Marcel went ahead and called Hope with Greta’s demands. Oops. Unsurprisingly, Hope eagerly agrees to suppress her werewolf in order to save her mother. Freya warns that her decision is probably not the best one, yet Hope remains firm. The spell, it’s happening, no matter what. It doesn’t matter if Hope could die or that Hope’s inner werewolf will be tortured for a millennia or more. Hope only cares about Hayley. She must return home, safe. Quickly crossing off an item on her bucket list, Hope dramatically says goodbye to Roman with a kiss, in case she doesn’t return. Freya speedily sparks a fire and says some magic words, and . . . Wait a minute, is that the moonstone?! I haven’t seen that thing in ages. Remember when Damon thought that the best place to hide it was in his soap dish. Ah, good times. Good times. Anyhoo, look who’s here. It’s Klaus! With the forethought to know the kind of people he has surrounded himself with, Klaus tells the girls that he always suspected such trickery. He knew they’d go behind his back. Luckily, Klaus arrives in time to stop Hope from making a huge mistake. He will not see Hope stuck with the same curse he once had to endure. This ends today. August has no idea about Klaus and his lineage. He has no idea that Klaus is part werewolf. So, when they start to squabble over August’s murderous rampage, it’s important that Klaus not give himself away. Elijah, instead, takes the lead. He has no use for August’s hateful words. Elijah warns August to flee and never return. August and his daughter, Antoinette, reluctantly leave the cafe. She’s heard all the stories, but nothing could compare to the real thing. His compassion to her plight, the way he understood her desperation to leave her deceptive family behind, it takes everything she has to stop herself from begging for his affection. He gives her a way out. He saves her from her family. Elijah Mikaelson is her savior. Later, she would call this love at first sight. Elijah is understandably upset by Antoinette’s deception. For seven years she lied to him, hiding the fact that they’ve met multiple times before, hiding her family’s heinous actions. Antoinette’s fear that he would leave her if she told him the truth is a sorry excuse, Elijah admits. She has many secrets, but some she shouldn’t keep. Antoinette knows what she did was cruel. She knows it wasn’t right. She just didn’t want to lose him. Elijah means everything to her. She wants to share a life with him. She wants to share the night with him. She prays and hopes their engagement isn’t through. In The Quarter, Marcel expectantly awaits for Klaus. What is he doing? It seems Klaus has been somewhat of a busy bee. If Greta and her clan mates hate hybrids so much, Klaus is going to create an army of them, just to spite her. Marcel is skeptical about this plan, but Klaus has no time for his petty misgivings. He has too much to deal with. Speaking of, back in the caverns, Josh approaches a soggy looking Greta. He tires to convince her to spill Hayley’s location, but the vampire holds her tongue. The minute she tells him, Klaus will kill her. Lol. So true. Greta can’t take much more. She snaps. She manages to release herself from her bindings and immediately takes aim at Josh. Wow. She’s really going to town. Greta attacks Josh with so much anger and force, Marcel remarks, “He’s lucky to still have his face.” Ouch. Gruesome. Looking for the location of August’s hideaway, Elijah and Klaus get to talking. Klaus is so focused on taking down August and his goons, Elijah worries that Klaus is picking an unnecessary fight. Klaus frowns. How is this not a war worth his time and his effort? Werewolves are being slaughtered. Klaus is a wolf, no matter how ugly that notion seems. It’s not a curse. It’s his life, a part of his soul. Elijah strongly proclaims his love for his brother, but for Klaus, it isn’t enough. Klaus needs Elijah to stand up, do something. His words mean nothing without an action behind them. Elijah looks at Klaus, dejected. What can he do? What can he say to make it right? How can he ever understand what has happened to Klaus? Klaus leaves, feeling rejected. Roman is happy to find Hope didn’t die after the spell. She shows him the binding spell, longing to complete the transition. She is three super-beings rolled into one. Would it be so bad if she lost her wolf? Roman smiles. Maybe there is a way for Hope to succeed in her mission. Roman convinces Hope to skip out on school and follow him. She’ll get her wish. That night, Klaus returns to August’s village. It’s time. Yep, it looks like Klaus is up to his old tricks again. He’s ripping out hearts, sprouting threats. His anger gets the best of him, sometimes. Klaus declares, if anyone picks up this coin (you know, the coin), the slaughter will be over. August confronts Klaus, but falters. He’s dead. He’s stone-cold dead. Klaus looks on, watching as August’s wife crawls and weeps at his feet. She picks up the coin, begging Klaus to spare her, Greta, to spare her daughter, Antoinette, and to spare her son, Roman. Klaus blames himself for everything, for sparking revenge in the hearts of those who hate. He blames himself for sparking their rage, for bringing them shame. He gifted them shame. Klaus, he was the match that lit the fuse. 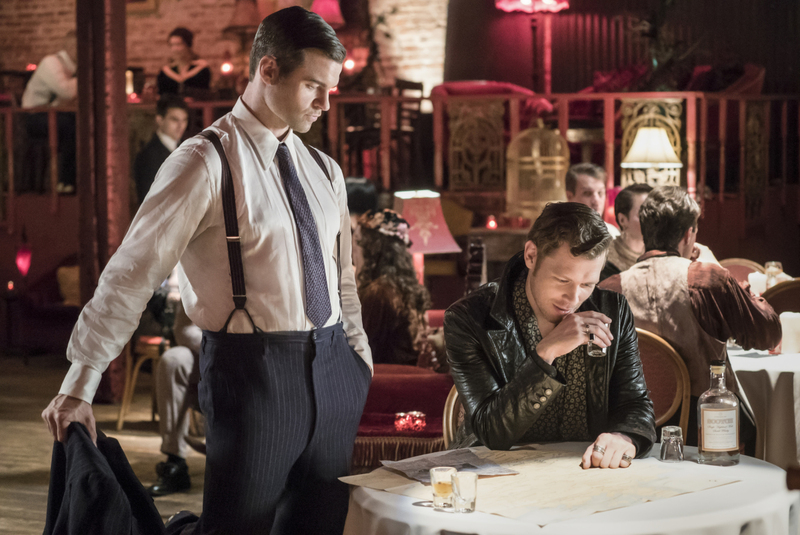 What did you think of this week’s episode of The Originals? Was it that much of a surprise to see that Greta was to blame for Hayley’s disappearance? Did you suspect Roman was in on it all along? Where is he taking Hope? Will she bind her werewolf? Where’s Headmaster Saltzman? Why isn’t he watching these kids? What is Greta’s end-game? Will she give up Hayley? Will Elijah ever return to Klaus? Is Antoinette in on it too? Tell me in the comments!